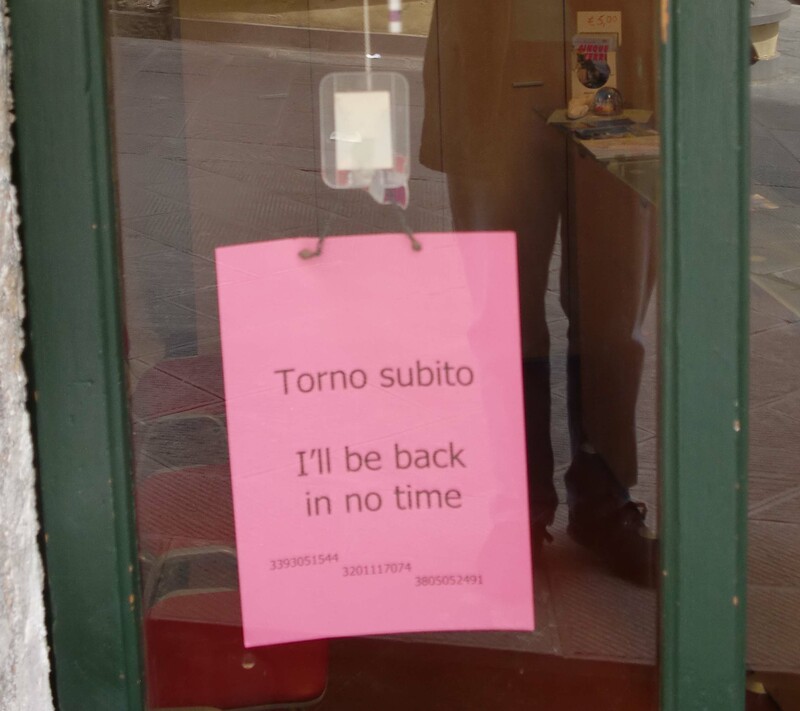 The train trip from France to Italy went without a hitch…well there was a train that failed to arrive but another was only an hour or so later. A border crossing, a few stops and a couple of changes of train later we were in Riomaggiore, one of the towns in the Cinque Terre region. 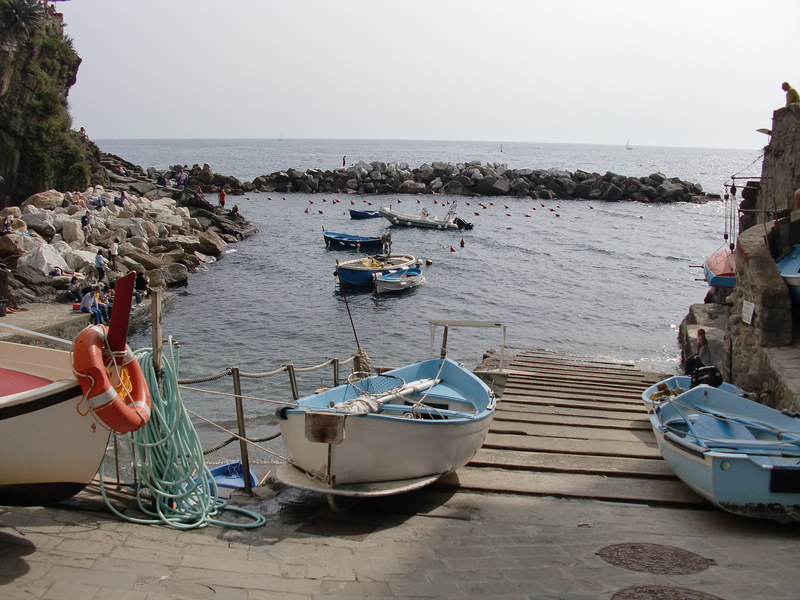 These are five small villages that were originally fishing ports and terraced vineyards and are now largely tourist destinations. 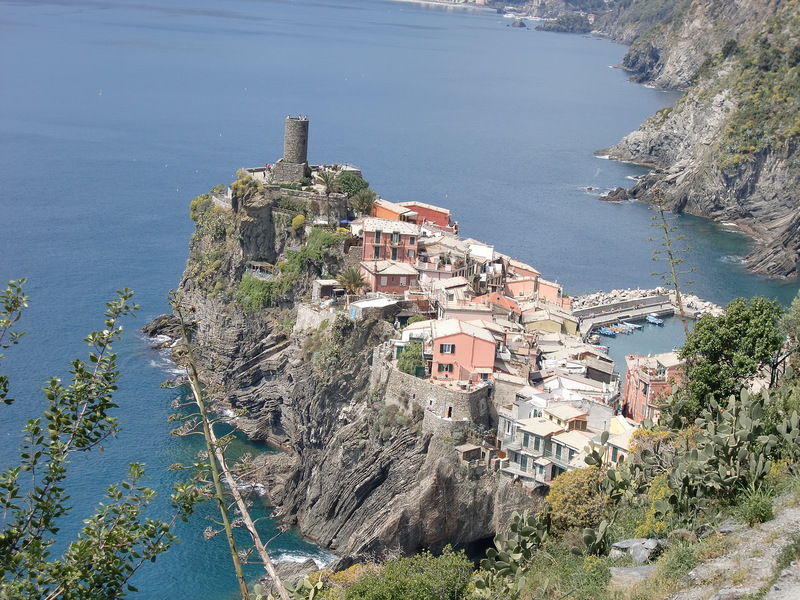 The villages cling to the Mediterranean cliff sides with footpaths and trains connecting them to each other. There is a sense of separation from the cares of the rest of the world. Staying in one of the villages gives you an uncrowded view after the day tourists leave. I’ll let Bubba tell his own story from here. 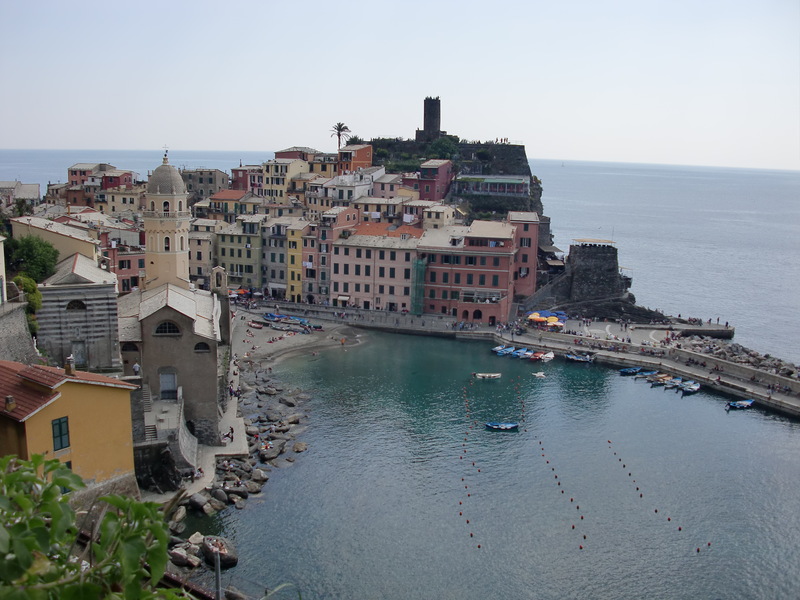 We arrived at Riomaggiore after a long and perilous train journey. 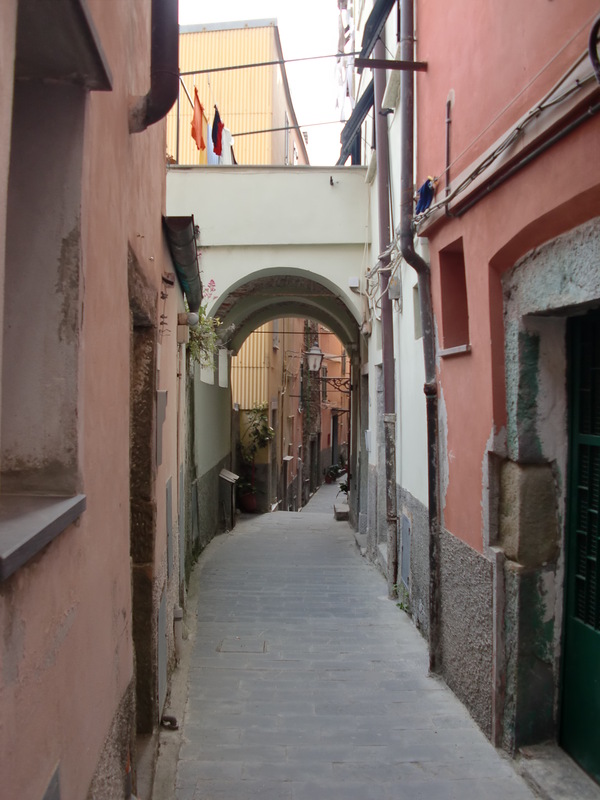 I located the office where we would pick up the keys to our room that was at the top of the long steep street. Everything, including check in, stopped for lunch and I had a short wait determined by the local clock, which operates in a casual manner. Our room was on the top floor of a small building further up the street. It included a terrace on the roof and a small kitchen. We were across from a small church and during the day and evening, the bells would ring from that and another church in town in a solemn competition. 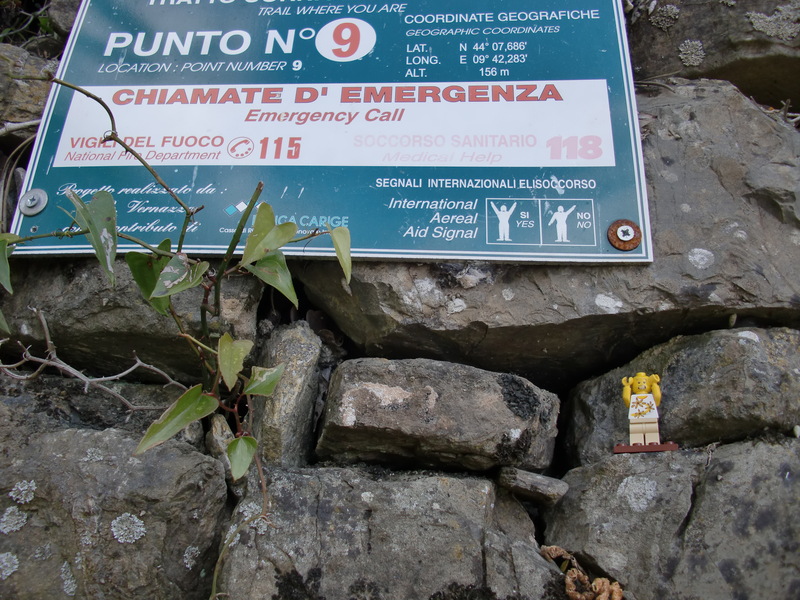 That afternoon, I explored the village with help from Rick and Spider (I don’t do stairs). The five villages are linked by scenic footpaths that range from very easy to moderately challenging. The ones we choose were not difficult for anyone whose legs are longer than a quarter of an inch. Bubba writes . . . The first part of the journey is pretty easy. 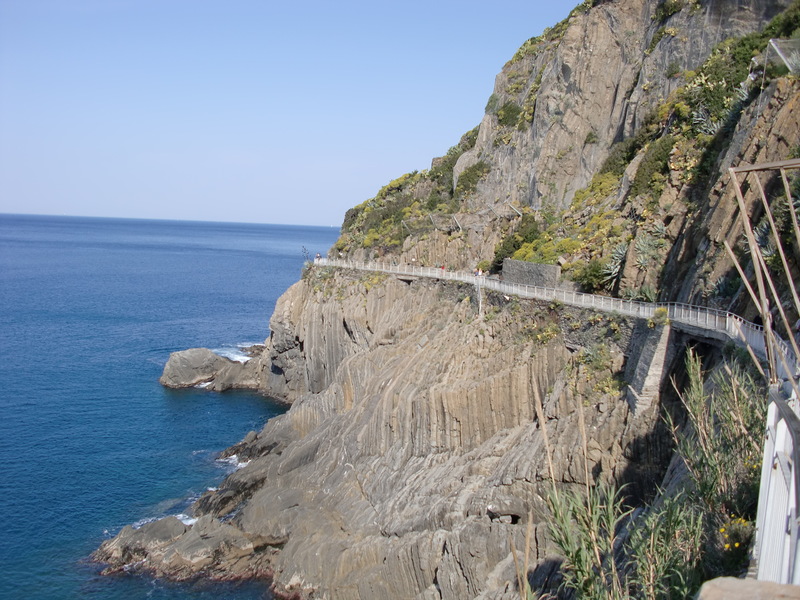 The path is called the Via dell’Amore and has been made very tourist friendly. It is mostly a concrete path that hugs the cliff next to the sea. It is a tradition for lovers to leave a lock to signify everlasting affection. I left a purple one for someone, someday. 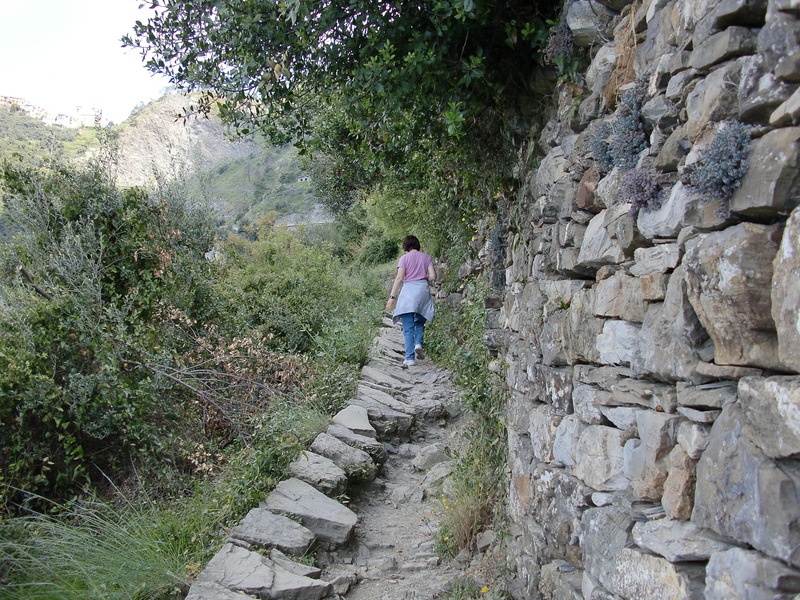 The paths give some tremendous views of the villages but deteriorate somewhat as you go along. It is uneven, rocky and has steep cliff faces on one side. I again donned the climbing garb and scaled the steep paths, following the experienced mountaineer ahead of me. Soon I was parched, and exhausted. Strange sounds of large carnivorous beasts filled the air and I was certain that death awaited me on a remote Italian cliffside. I became disoriented and tried to signal a passing rescue chopper, like the emergency signs suggested but, for some strange reason, they didn’t see me. Luckily a rescue party that set off from one of the villages located me and brought me back to safety. These were experienced, professional rescue workers with decades of rescues to their credit. I have to interrupt to bring Bubba back to reality. 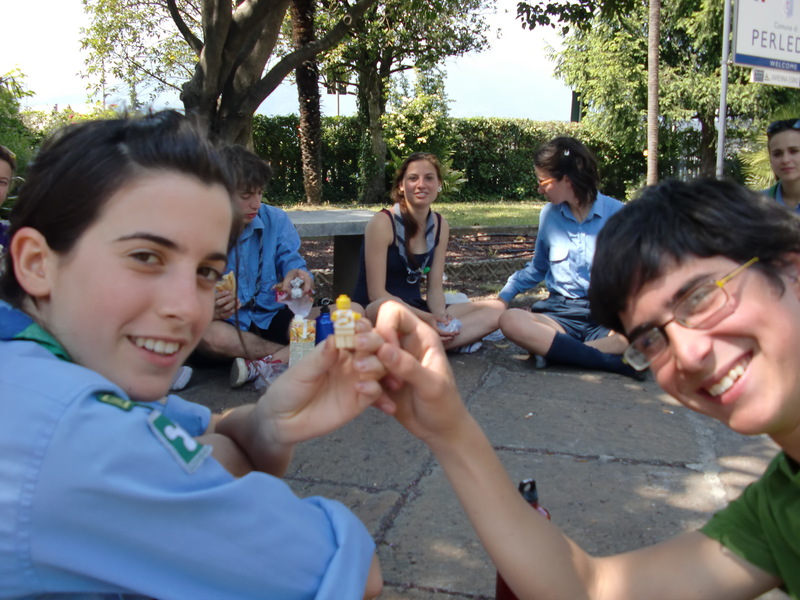 His friends in the picture are a group of scouts just saying, “Boungiorno”. No rescue was necessary. 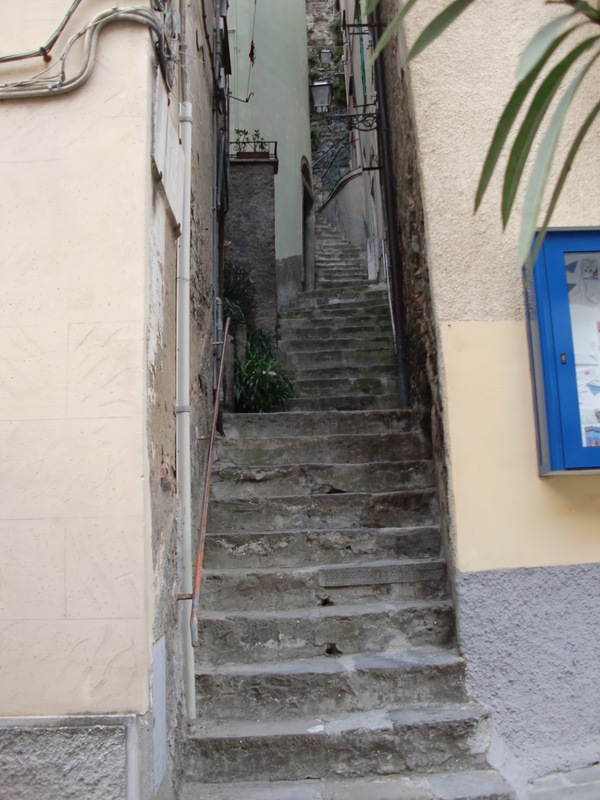 Bubba ran out of gas and had to be carried when we reached Vernazza because he didn’t want to climb down to village level again. Luckily, Bubba’s added weight did not mean leaving anything behind. While the others continued on with their trek I recuperated and was treated for my injuries by highly trained and professional staff. I’m on the rock at the bottom of the picture. Can you see me? 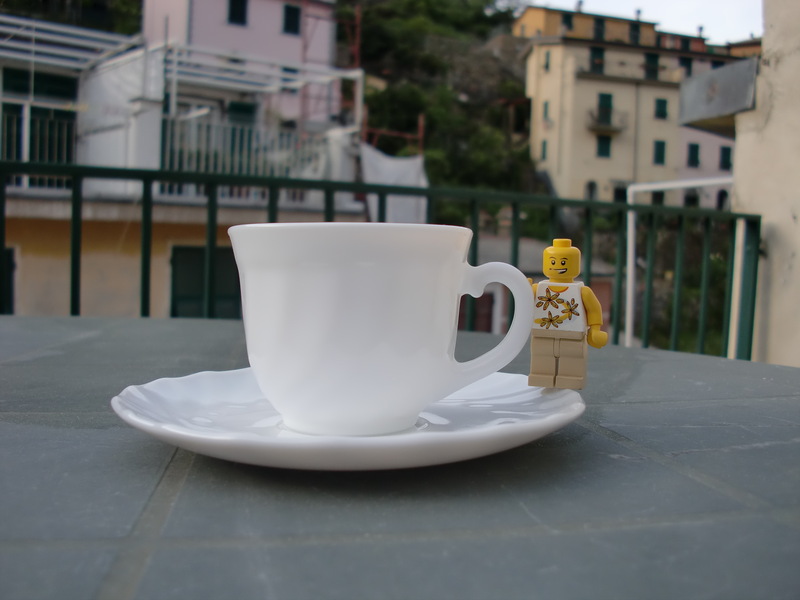 I met back up with everyone at the room while enjoying a cup of coffee on the terrace. I like the coffee here as it comes in my size cups. Although we stayed on in the area for a few days, Bubba was so exhausted from his experience that he just stayed in the room. Bubba will write again from Florence. 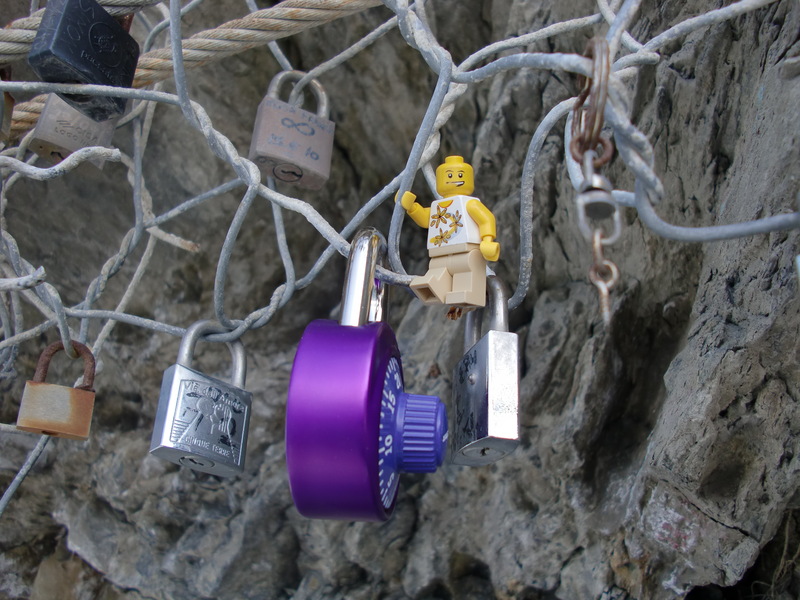 This entry was posted in Humor, italy, Leggos, Legos, Travel. Bookmark the permalink.